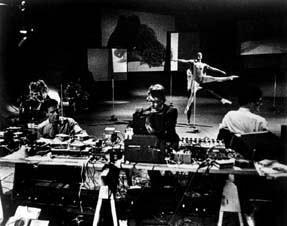 John Cage made «Variations V» in 1965 for the Merce Cunningham Dance Company. He and David Tudor settled on two systems for the sound to be affected by movement. For the first, Billy Klüver and his colleagues set up a system of directional photocells aimed at the stage lights, so that the dancers triggered sounds as they cut the light beams with their movements. A second system used a series of antennas. When a dancer came within four feet of an antenna a sound would result. Ten photocells were wired to activate tape-recorders and short-wave radios. Cecil Coker designed a control circuit, which was built by my assistant Witt Wittnebert. Film footage by Stan VanDerBeek and Nam June Paik’s manipulated television images were projected on screens behind the dancers. The score was created by flipping coins to determine each element and consisted of thirty-five «remarks» outlining the structure, components, and methodology. The specific sound score would change at each performance as it was created by radio antennas responding to the dancers’ movements.